It's been called ethereal, mysterious, spooky and a rediscovered masterpiece. Whatever you think of it, the art world's eyes were on tonight's New York auction of the Salvator Mundi (Saviour of the World) — touted as a long-lost painting by the Renaissance master Leonardo da Vinci. It's been called ethereal, mysterious, spooky and a rediscovered masterpiece. Whatever you think of it, the art world's eyes were on tonight's New York auction of the Salvator Mundi ("Saviour of the World") — touted as a long-lost painting by the Renaissance master Leonardo da Vinci. Dating from the 1500s, the work is billed as the final Leonardo work held in private hands, one of fewer than 20 attributed works by the artist and valued by Christie's auction house at $100 million US. Bidding was expected to start at around $100 million, but opened at $75 million. Christie's said the painting drew bids from at least 45 clients, with the field narrowing as bids soared. The price topped $300 million about halfway through the bidding. After a tense period of bidding, during which the auctioneer nudged the price ever-upward, the painting finally sold for a hammer price $400 million, far exceeding initial estimates. The total price, which includes the auction-house premium, was $450,312,500, which Christie's says makes it the highest price ever paid for a piece of art sold at auction. The final, record-breaking bid came about 20 minutes into the auction and drew claps and cheers from the crowd. The final two bidders were both acting on behalf of anonymous clients. Christie's says the winning bid was placed by its own co-chairman of post-war and contemporary art, Alex Rotter, who was acting for an unnamed client bidding by phone. Depicting a half-length, front-facing Christ figure grasping a crystal orb in one hand, with the other raised in a gesture of benediction, the work is an outlier of sorts for Christie's annual auction of post-war and contemporary art. Regardless, it was definitely a highlight and positioned close to the top of the sale as the ninth lot. The artwork, put up for sale by Russian billionaire Dmitry Rybolovlev, is fascinating for a host of reasons. The painting is one of the works cited in a legal battle between Rybolovlev and his former art adviser, Yves Bouvier. The Russian oligarch has accused Swiss dealer Bouvier of bilking him out of hundreds of millions of dollars through art purchases over the years. Rybolovlev alleges that he enlisted Bouvier to serve as an art-buying intermediary, but that the dealer instead bought pieces he was interested in and resold them to him with a massive markup, including with his 2013 purchase of the Salvator Mundi. The painting has had its share of work done, most recently by esteemed New York-based restoration specialist Dianne Dwyer Modestini. 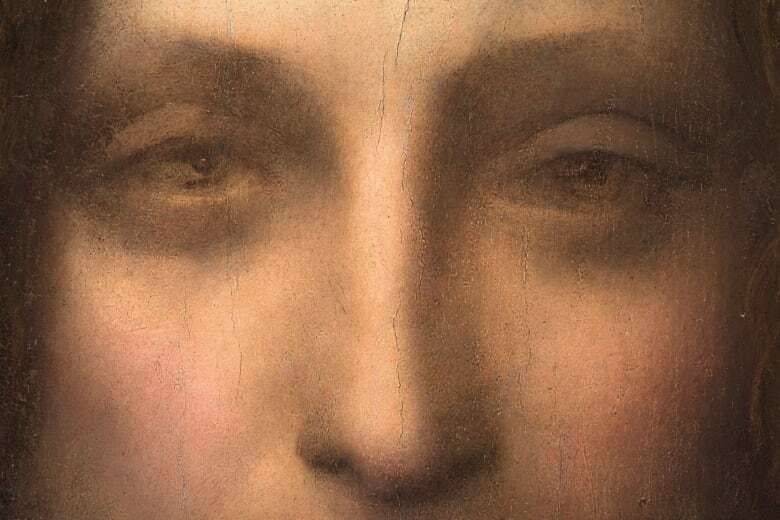 Long believed an artwork executed by one of Leonardo's pupils, the original painting was covered over by a subsequent artist. The walnut panel base, which has been described as "worm-tunnelled," also split in half at some point. Earlier attempts to join the two halves and restore the work resulted in abrasions and also removed delicate details from the original. Because of all this, the Salvator Mundi was only recently authenticated by experts, including the Metropolitan Museum of Art in New York. An American art expert named Robert Simon discovered it for sale at a regional U.S. auction in 2005 and, on a hunch, invested in years of cleaning, restoration and researching its source. In 2011, it was announced as a true piece by Leonardo and included in the British National Gallery's exhibit Leonardo da Vinci: Painter at the Court of Milan. Since its unveiling in 2011, controversy has swirled around the painting, which was known to exist through copies and inclusion in inventories. The question of whether it truly is a work by the masterful Leonardo is debated to this day. Others wonder if the painted over and over-cleaned panel might actually be a piece on which da Vinci collaborated with a pupil. Still others remain dubious because of the "incorrect" depiction of the orb in Christ's hand: the science-obsessed Leonardo would have surely depicted the object's light-refraction accurately, they argue. Salvator Mundi set a new record high price for an old master artwork sold at auction and toppled the previous record set by Canadian Ken Thomson in 2002. That year, the late media mogul purchased the Peter Paul Rubens masterpiece The Massacre of the Innocents at a Sotheby's London sale for £49.5 million (about $76.7 million US at the time). If you're one of the thousands who stopped by a Christie's location (it went on display in Hong Kong, London, San Francisco and New York) to check out the work prior to the auction, you might be on camera. The auction house captured the expressions of a myriad of people who stopped in to take a peek — including Patti Smith and Leonardo DiCaprio — and shared the footage both on social media and in a short video feature.